Just ahead of World Ocean Day, the CEO of the Dalhousie-led Ocean Frontier Institute is taking her message about safe and sustainable ocean development to the United Nations (UN). 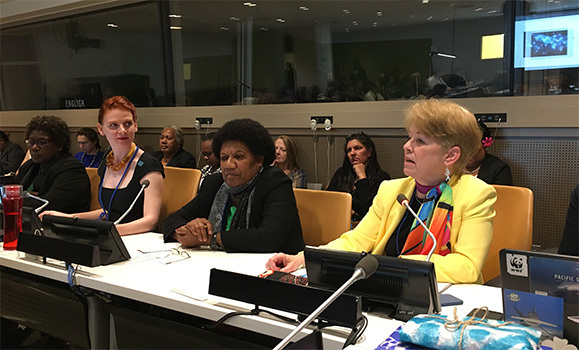 On Monday, Wendy Watson-Wright spoke at the first ever UN Ocean Conference, hosted at UN headquarters in New York, advocating for more women to pursue careers in ocean management and science. She spoke about what needs to happen to attract not just heroes but “she-roes” to ocean-related careers, building on a concept first voiced by poet Maya Angelou. On Tuesday, she put the spotlight on Ocean School, a partnership between Dalhousie and the National Film Board, which advances ocean literacy among youth. This presentation was in support of a voluntary commitment the Ocean School team, led by Dalhousie’s Boris Worm, helped draft in support of Sustainable Development Goal 14 (SDG 14), which identifies actions to sustainably use the ocean, seas and marine resources. Diversity and youth involvement she says, have the same goal: attracting the talent needed to find solutions to the ocean’s challenges and encouraging career choices that use innovation and the principles of sustainable development to grow our economy. According to the Organization for Economic Co-operation and Development, the value of the opportunity for ocean development is approximately $3 trillion US, an estimate anchored by traditional investments in Maritime and coastal tourism, resource development, shipbuilding and port activities. But this blue economy will also be built through new, innovative approaches: ocean data analytics, ecosystem-based fisheries management, aquaculture and ocean renewable-energy systems to name a few. And the Ocean Frontier Institute (OFI) — a partnership between Dalhousie, Memorial University of Newfoundland and the University of Prince Edward Island — is playing a key role in leveraging this opportunity. Established in the fall of 2016 through $220 million in funding from the Government of Canada and various private and public sector organizations, OFI supports research projects, personnel exchange, infrastructure sharing and more at its partner universities and eight international institute partners. June 2-11 is Ocean Week in Halifax, which provides an opportunity to celebrate our shared ocean. A big part of the week is World Ocean Day, held on June 8. The concept of was first proposed in 1992 by the Government of Canada at the Earth Summit in Rio de Janeiro. A United Nations General Assembly resolution was passed in December 2008, which led to the official recognition of the day. Each year, an increasing number of countries and organizations participate in this annual event. To mark World Ocean Day, the Dalhousie-affiliated International Ocean Institute (IOI) is hosting its annual Elisabeth Mann Borgese lecture. The focus of the event will be on marine protected areas, and will feature whale songs, live streaming and updates from the first UN Oceans Conference in New York as well as a panel discussion. This year’s lecture will be hosted by the Manager of Marine Programmes at the Canadian Wildlife Federation, Sean Brilliant. In addition to Brilliant, panelists include Maxine Westhead, Section Head, Protected Areas and Conservation Planning, Oceans and Coastal Management Division of the Department of Fisheries and Oceans; Ken Paul, Director of Fisheries, Atlantic Policy Congress of First Nations Chiefs Secretariat; Paul Barnes, Director, Atlantic Canada & Artic, Canadian Association of Petroleum Producers and Veronika Brzeski, Executive Director, Cape Breton Fish Harvesters Association. There will be many ocean-focused and community activities available to the public this week. For more information, visit the Ocean Week Halifax website. This story originally appeared on Dal News.